Sixteen years ago, as I wandered the streets of London on a two-day layover between Prague and Texas, I happened across a comics store near (I believe) the Museum of Natural History. I didn’t have much money on me, so I could only pick up a couple of books. Tempted as I was by the amazing-looking X-Files manga (which I still regret passing up), I do think I made the right choice by instead buying the first two volumes of Maison Ikkoku. It became an instant favorite. I haven’t read MI for more than a decade; the last time I looked through it, the girl I’d been dating had just dumped me and I basically revisited MI so I could wallow in misery and feel sorry for myself. I randomly started re-reading it last night, and I have to say it’s a wildly different experience than before. In the past, I read it as a sweet but strained and needlessly contrived soap opera. Now, I’m not so sure. The difference is entirely mine; MI itself is still exactly as it was before. I almost don’t have to read it, honestly. I remember the gags, the expressions, Gerard Jones’ witty and mercifully non-literal translation, the story beats, the layouts. But today I look at these elements through a different lens: One older, more aware of the nuances of relationships, and better capable of understanding the distinct and fleeting moment of a very specific culture and instant in time in which the story was set. Between MI and Mad Men, I seem to be drawn to tales of change and uncertainty of late. It’s probably a coincidence, but I suppose I could make a convincing case for a more deeply rooted reason as well. The year has been filled with loss and upheaval for me, and just as I turned to MI for its resonance with my romantic heartache in the past, maybe I’m drawn to it for its greater themes of change, maturation, and determination now. I don’t know. I just write these blogs, I don’t have to rationalize them. 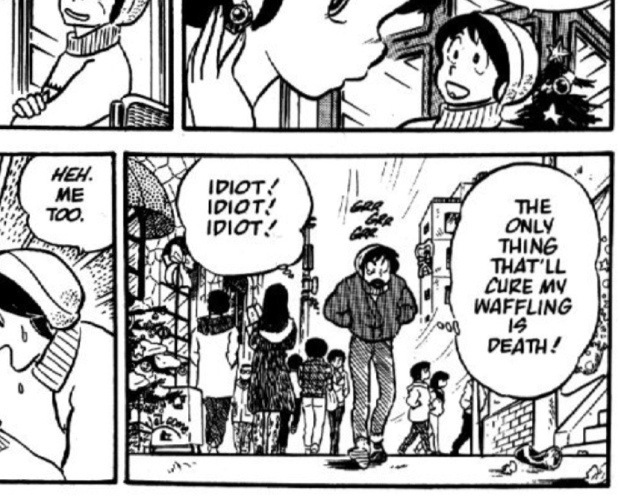 Like I said, Maison Ikkoku is set against a backdrop of cultural transition not entirely unlike Mad Men. The 1980s in Japan weren’t a perfect parallel for 1960s America, but both represented something of a golden age for each society in which social roles were changing radically as prosperity and optimism spread only to be shocked into submission in the following decade (by Vietnam and the oil crisis for America, the collapse of the Bubble Economy in Japan). MI isn’t as conspicuously set up to be a morality play about its setting as Mad Men, of course, because it was a product of the time in which its story was set rather than a critique insulated and informed by 50 years of hindsight. Nevertheless, the shifting mores of its culture define the shape of MI’s tale and lend much-needed context to the central relationships around which the tale pivots. Factors like social standing, propriety, expectation, and self-censure guide the characters’ actions in a way that likely wouldn’t be the case today. These things didn’t ring true to me and my limited perspective a decade ago, and from what I understand I don’t think they’d really resonate with modern Japanese youth, either. But MI was authentic enough to its contemporary audience to become a smash hit, and decades later the semi-historical glimpse it offers into a society hanging onto the ragged remains of a bygone way of life makes it utterly fascinating in hindsight. And it’s still alternately sweet and funny by turns, as well, which makes it a great read in any era. This entry was posted in Comics, Media and tagged Comics, maison ikkoku, media. Bookmark the permalink. Wow, well, wish granted then. Nice timing. Hard to believe MI came from the creator of Ranma 1/2, but you’ve framed MI here in a way that makes it sound super-intriguing. Japan now certainly isn’t like it was in the ’80s (not that I was around to experience it then), so I’d be interested to see that decade’s portrayal in manga. Rumiko Takahashi specializes in teen/young adult manga series, and I don’t have enough experience with her one-shots to know if she’s bolder with them. When I saw the male lead I thought it was Ataru from Urusei Yatsura, so I don’t have any problems believing MI is her handiwork. I actually like the silly stuff she produces and managed to slog through her Ranma 1/2 and Urusei Yatsura manga over the course of a few unusually vapid weekends. I say slog because it felt like she’d run out of all of the grade-A ideas she had for the manga’s sitcom formula and trended into B-C range stuff for about a year before closing up the series. I guess I have to go look up MI while I hunt down Even an Ape Can Draw Manga. Ikkoku really is as endearing as it is humane; it must be my favorite of Takahashi’s works, based on the eight or so volumes I’ve read. I really need to snap up the rest of them already. My sister bought the first few volumes of Maison Ikkoku back in either the late 90s or very early 2000s. At the time, I would devour anything comic related I could get my hands on, and MI was no exception. Once she realized I was enjoying the volumes so much, she stopped buying them. Of course, I started buying them myself and finished off the series, spending considerably more putting the whole collection together than she did. Maison Ikkoku is wonderful. I don’t like any other Rumiko Takahashi work, but Maison Ikkoku is one of the most endearing Japanese comics out there. If nothing else by Takahashi has any heart, it’s because she poured all of it into Maison Ikkoku. I just finished it up again late last year, and reading this makes me think it’s time for another read. Read the entire thing. It only gets better as it goes on, and it never outstays its welcome. You’ve convinced me – is there a particular edition/translation of the series you’d recommend? A quick peek at amazon tells me that the “complete” English editions of MI came out between ’03 and ’06. Hope you have those–they kept all the chapters. Even the stupid and pointless ones. The soap opera parts of early Ranma 1/2 anime were what made me think anime could be worthwhile as a hobby in the long run, and when I found out this other work by Rumiko Takahashi was coming out in English (in the pamphlet-style, flopped comics form Viz was using in those days), I jumped on it. I loved it, shared it with my family, including my parents who were in their 50s at the time, and they loved it, too. It’s a great growing-up tale. Whether it’s “about” sorting out what you really want from a relationship, moving beyond loss, or facing the working world and starting your adult life as someone who is not equipped to be conventionally successful. Always wanted to check out the series, but inevitably put it off until later. Now, it’s out of print. Baka, indeed. I absolutely loved Maison Ikkoku. I discovered it through Rumiko Takahasi’s other works, having first fallen in love with Urusei Yatsura in college in the early 1990s. Some years ago I “lucked” into, for lack of a better word, a crate of Takahashi manga collections in a our local comic shop. I say “lucked” because it was at someone else’s cost. A local woman had brought her late son’s comic collection in to sell on consignment. The few volumes not included I bought used on Amazon, and quickly I owned the entire run of both Maison Ikkoku and Ranma 1/2, both of which were translated and printed in the US to their completion. Urusei Yatsura was sort of dumped by VIZ Comics partway through and only a few volumes are available. Ranma 1/2 was cute, and I will always love UY, but Maison Ikkoku was genuinely sweet in a way I haven’t seen in many other comics. My wife and I just bought a house and are moving this weekend. I boxed up all our books, and when I got to the manga shelf I decided I’d sell the Ranma and others once we’re settled in, as I haven’t read them in years. I’m tempted to read MI again. Maybe I’ll keep those. I remember how ticked off I was when Viz stopped bringing the anime on VHS to the States after 40, or so, episodes. Then years later they picked it up again but by that point it just wasn’t the same – I had plowed through the manga probably three times by then and even with Gilbert O’Sullivan’s “Get Down” playing, the anime could not live up to the printed works. Absolutely essential reading, and this is coming from someone who thought Ranma 1/2 was basically religion. It’s pretty impressive to go back and read Viz’s old Rumiko Takahashi comics like MI and Lum and see just how wonderful the writing is, especially compared to the stuff that Tokyo Pop and what seems to be the majority of scanlators put out. It’s like the translators and editors were more concerned with putting out something funny/entertaining instead of trying to make it as literal as possible. And that is why that old stuff is so terrible! Didn’t they have any respect for the perfection of the Mother Tongue!? I think it also helped that they localized fewer titles on a slower schedule back then. Tokyopop churns as much content as possible as quickly as they can to strike before the scanlators, which doesn’t do much for upholding quality.